When it comes to orthotic management of pediatric patients with hypotonia, the medical literature is only beginning to document the effectiveness that clinicians have been reporting anecdotally for years. “The efficacy of treating low tone with orthoses is very poorly studied, but it is the standard of care because I feel intuitively that we can help these kids, and because we’ve seen good clinical results,” said Kathy Martin, PT, DHS, a professor and director of the Doctor of Physical Therapy program at the University of Indianapolis. 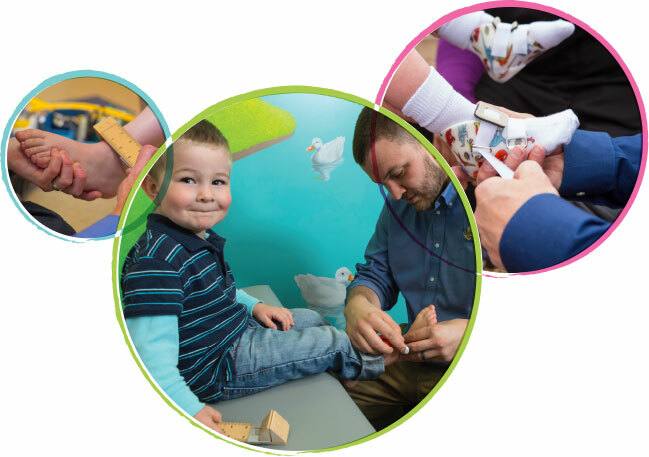 Important considerations related to orthotic management of children with hypotonia include which children need what type of device (whether an ankle-foot orthosis, a supramalleolar orthosis, or an in-shoe foot orthosis) and how early to intervene. Martin and a couple of colleagues—Julia Looper, PT, PhD, assistant professor of physical therapy at the University of Puget Sound, in Tacoma, WA; and Shelby-Silverstein, who is associate professor of physical therapy at Neumann University in Aston, PA—have put together a proposal for a multisite clinical trial to assess treatment variables, but, even if funding becomes available, results are likely years away. As noted, clinicians have seen results in their own practices. Bertram said if the orthosis is flexible enough, it will allow the child to explore movement range but still return them to a more normal biomechanical alignment in the gait cycle. The needs of individual patients with hypotonia can be complex and challenging, however. Henry prefers flexible SMOs because they allow all the important motions in the sagittal plane—plantar flexion and dorsiflexion at the ankle, forefoot extension, and the like. “The child can pronate and supinate out of subtalar neutral, which is what you want,” he said. He too believes in bracing earlier rather than later. Faye McNerney, PT, DPT, a pediatric physical therapist in Troy, OH, has seen the field evolve over the course of her 36 years of practice. “I used to lock up the foot using a rigid SMO or AFO, because I was afraid of what would happen to their foot if they kept rolling inward,” she said. McNerney has seen the positive effects of SMOs as her own practice patterns have changed over the years. One controversy that has arisen in recent years has to do with the point in the child’s development when orthotic intervention is most appropriate. In her studies of Down syndrome patients, for example, Julia Looper has argued that intervening prior to the acquisition of independent walking may interfere with the child’s motor-learning skills.6-8 Kathy Martin acknowledges that this may be the case but points out that it is also important to consider the larger context of cognitive and emotional development. In her conversation with LER, Looper addressed this collegial disagreement by conceding the point. Looper’s position now is that children with milder conditions, who may need to wear orthoses for a shorter period of time, might benefit from watchful waiting. “I think there is a gradation, and it depends on how much calcaneal eversion we’re seeing, and what’s going on generally with the child,” she said. Martin emphasized, however, that orthotic interventions have to be carefully selected and matched to the child. Too little is a problem, but so is too much. If there’s a practitioner who has redefined the meaning of early intervention, it’s Debbie Strobach, MA, PT, a pediatric physical therapist and splinting specialist at Mercy Children’s Hospital in St. Louis, MO. “We splint children with AFOs before they leave our neonatal intensive care unit,” Strobach said. According to Strobach, preemies born earlier than 30 weeks have a higher risk of hypotonia and muscle imbalance, and may present with significant ankle and hindfoot eversion. This, in turn, causes problems with adjoining muscles. Strobach and her colleagues use customized solid ankle-foot splints similar to AFOs to counteract such forces. She has been able to assess the effects of her interventions simply by comparing them to children who didn’t receive them. Strobach and her colleagues also deal with older children with benign hypotonia, who typically get SMOs or UCBL (University of California Biomechanics Laboratory)-style splints. Such approaches, however convincing, remain more a matter of personal clinical experience than evidence-based medicine. Given the paucity of controlled trials, then, clinicians are increasingly documenting their results. Megan Smith, CO, director of clinical research for SureStep, a maker of flexible SMOs, presented the findings of four recent case studies at the O&P World Congress in Orlando in September 2013. “We found that the kids who wore the SMOs had a rate of change 1.8 times greater than normal,” she said. “In other words, they were acquiring gross motor skills nearly twice as fast as normal kids and catching up to their peers. As clinicians continue to define and refine the effectiveness of their interventions, and if better funding becomes available to conduct randomized trials, ideally the kind of protocols described here will become better documented, adjusted, and, where appropriate, standardized. It will make life easier for practitioners, of course, but the ultimate beneficiaries will be children whose development has been hindered by hypotonia. 1. Selby-Silverstein L, Hillstrom HJ, Palisano RJ. The effect of foot orthoses on standing foot posture and gait of young children with Down syndrome. NeuroRehabilitation 2001;16(3):183-193. 2. Tamminga JS, Martin KS, Miller EW. Single-subject design study of two types of supramalleolar orthoses for young children with Down syndrome. Pediatr Phys Ther 2012;24(3):278-284. 3. Martin K. Effects of supramalleolar orthoses on postural stability in children with Down syndrome. Dev Med Child Neurol 2004;46(6):406-411. 4. Grosset JF, Onambele-Pearson G. Effect of foot and ankle immobilization one leg and thigh muscles’ volume and morphology: a case study using magnetic resonance imaging. Anat Rec 2008;291(12):1673-1683. 5. Grosset JF, Lapole T, Mora I, et al. Follow-up of ankle stiffness and electromechanical delay in immobilized children: three case studies. J Electroyogr Kinesiol 2010;20(4):642-647. 6. 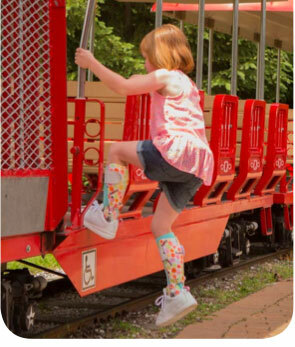 Looper J. Orthosis use in children with Down syndrome. LER 2013;5(4): 31-37. 7. Looper J, Ulrich DA. Effect of treadmill training and supramalleolar orthosis use on motor skill development in infants with Down syndrome: a randomized clinical trial. Phys Ther 2010;90(3):382–90. 8. Looper J, Benjamin D, Nolan M, Schumm D. What to measure when determining orthotic needs in children with Down syndrome: a pilot study. Pediatr Phys Ther 2012; 24(4):313-319. 9. Folio MK, Fewell R. Peabody developmental motor scales and activity cards. Chicago: Riverside Publishing; 1983.